As for today’s post —yes, it’s more banana bonanza! When I said it wouldn’t last another day? Well, I lied. Apparently they clung on for a few more days. This time, I made a plain old banana bread but with buttermilk. Don’t let this deceive you. 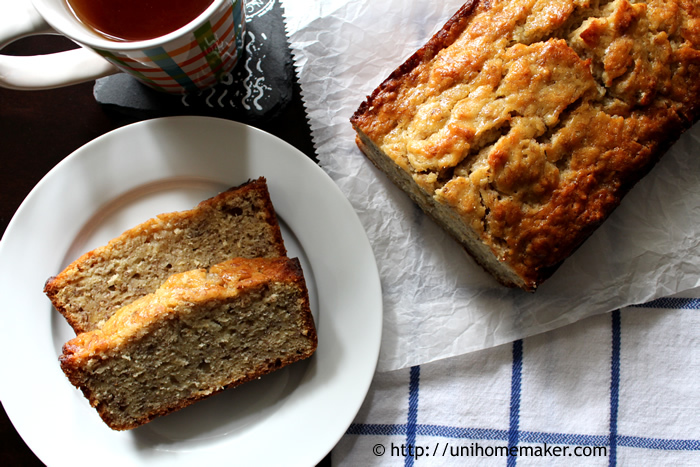 It may seem like an ordinary banana bread, but the taste is extraordinary! This bread is banana-y and very dense. Most banana bread I’ve had are soft, delicious, and sometimes rich. But the density of this bread takes banana bread to the next level. I had two slices of this in one sitting—that’s how good it was. 😀 The next time you are looking to make a banana bread, make this and you’ll see what I mean. Enjoy the weekend! Using a stand mixer (or mix by hand) cream butter and sugar until fluffy. Beat in eggs, mashed bananas, buttermilk and vanilla extract. Add flour, baking powder, baking soda and salt. Mix until well combined. Pour batter into the prepared pan and bake for 55-60 or until toothpick/tester inserted into the center comes out clean. Let the bread cool in the pan on the cooling rack completely before serving. I definitely agree that there’s something special about this banana bread recipe. I don’t know food science enough to figure out what it is, but the texture is dense and cake-like. Is that from the buttermilk? I especially love the golden color of the crust! They went quick didn’t they? 😀 I can see us making more of this soon. Fantastic. I love buttermilk and banana bread. I should definitely try this one. The problem is my boyfriend always eats all the bananas before I have time to bake with them. Perhaps I should hide some away from him! The pictures are beautiful! You’re so sweet, thanks Darya. I would definitely stash some bananas away for this recipe. 😉 Cheers! If I had butter in I would make this over the weekend. It’ll have to wait until Monday as I have unopened buttermilk that needs using, and two bananas in the cupboard. Would it be possible to use half all-purpose and half strong wholemeal (that I bought in for making N. Irish wheaten bread) and that way reduce the soft brown sugar I would use. Huh, really excited about baking next week! This is how my family has made banana bread for generations–strip the ingredients to a minimum, and focus on the flavor of the bananas. My guess is the acid of the buttermilk helps to enhance the flavors. Yum! 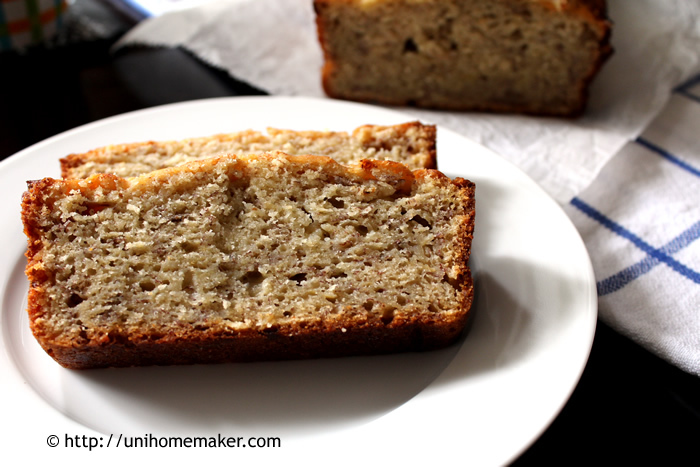 Banana bread is such a treat! I love the aroma as it bakes in the oven or cools on the rack. Love it with a slathering of butter or honey when it’s still a bit on the warm side. I’m anxious to try your recipe using buttermilk. I bet it goes very well with the bananas. Good one, Anne. That looks like a lovely Bread. I have never been able to successfully bake a Banana Bread. This one looks great. Will try it. Congratulations on being mentioned for your seafood pancake recipe. I just took a peek and I am going to have to make it soon. It was one of our favorite dishes at a Korean restaurant we used to frequent. Thanks Nami! Hope you recover soon. Take care. The buttermilk caught my attention. 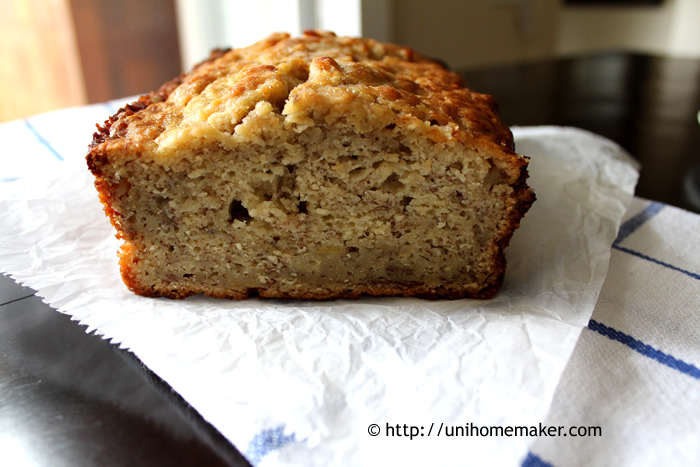 I just happen to have some…and always a supply of overripe bananas. Will have to give this a try. We like to throw some chocolate chunks in ours, too. Thanks for the mention Anne 🙂 I love banana bread. It’s one of those rare times I enjoy eating cake without a thick layer of icing! Your version looks delicious. I think we should nickname you Uni HomeBaker! You bake so many delicious treats and this banana bread is no exception. Looks very moist and flavorful. Haha, that’s too funny! Great nickname. 😉 And thank you for the kind comment Jan! Homemade banana bread is the best! It looks delicious. I love the use of butter milk. Looks so yummy! just made some into muffins because I don’t have a loaf pan and my roommate loves them. i will definitely be using this recipe again. any excuse to use buttermilk is my kind of recipe. i added a dash of cinnamon. i’m glad this recipe doesn’t require so much sugar compared to other recipes. it’s sweet but not too sweet and i like the texture too.